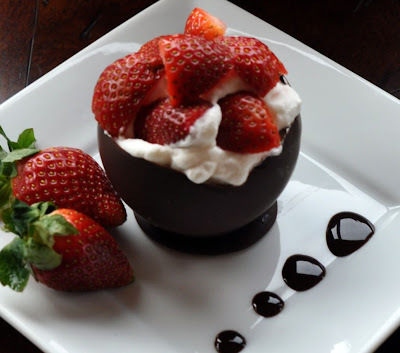 This is the perfect dessert for Valentine's Day. It is fun, unique and tastes amazing! Chambord/Framboise = Raspberry, Grand Marnier/Triple Sec = Orange. (I happen to LOVE Chambord and use it on/in everything. You also could substitute any flavor extract if you want it to be alcohol free. Just remember use 1/2 the amount of extract than you would alcohol. 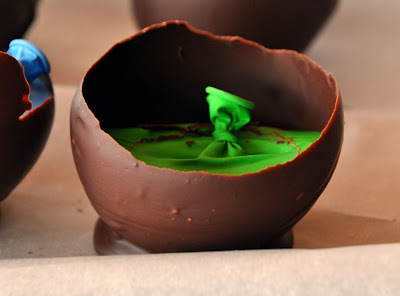 *Make sure you use latex-free balloons if you or those who are eating the chocolate bowls have allergies. 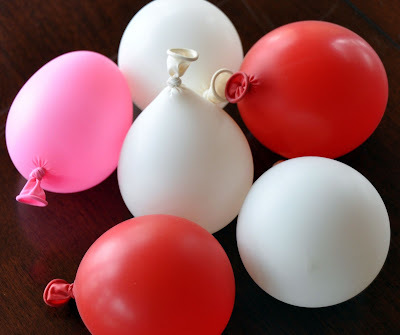 Blow up the balloons (you want them small and round, like little bowls). Boil water in a pan and reduce to simmer. 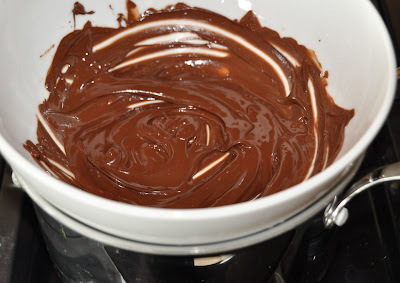 Set another pan or microwavable glass bowl on top of the simmering water and put in half of the chocolate (don't let steam touch chocolate), stir continuously and let it melt. 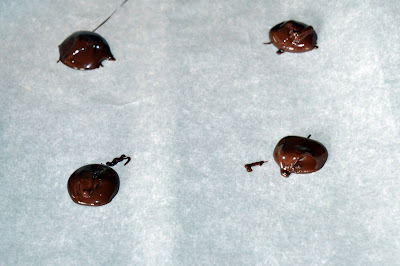 Remove from heat and stir in remaining chocolate until smooth. 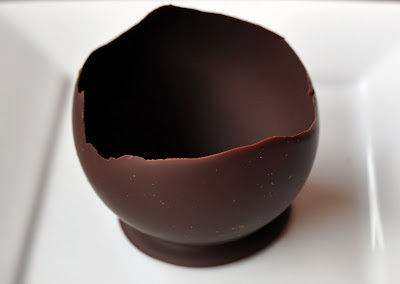 Drop 8 1/2-teaspoons of melted chocolate on parchment paper to make disks…you are creating the bottom of the bowls (so they don’t leak). 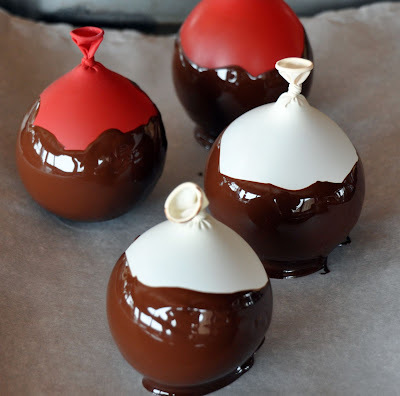 Next, carefully dip each balloon (about 1/2 to 3/4 of balloon) into the melted chocolate and set on top of the chocolate disks on parchment paper. Let set in fridge for about 30 minutes. After 30 minutes take the cookie sheets out and let the bowls sit for about 5-10 minutes. While pinching the tops of the balloon snip or poke a hole to release the air…SLOWLY. Hopefully, the balloon will release freely. If it doesn’t, do not pull the balloon away from chocolate just let it sit for a few more minutes and the chocolate should release the balloon on its own. The bowls are delicate. Keep the bowls on the cookie sheet and put back in fridge. 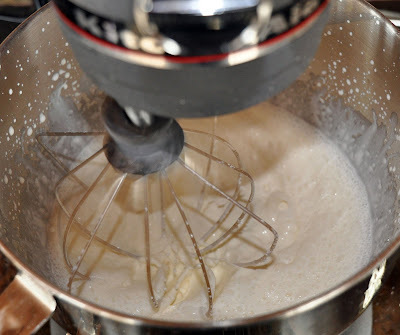 In a standing mixer with a wire whisk combine the heavy cream, Chambord and powdered sugar. 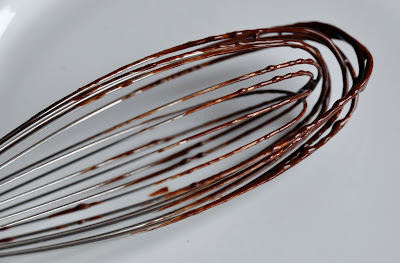 Whip on low for about 30 seconds so it doesn’t splatter. 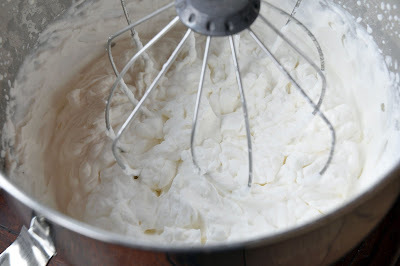 Increase to high and whip until peaks form and can hold their shape…about 3 – 4 minutes (don’t over mix). Bring the chocolate bowls out of the fridge. 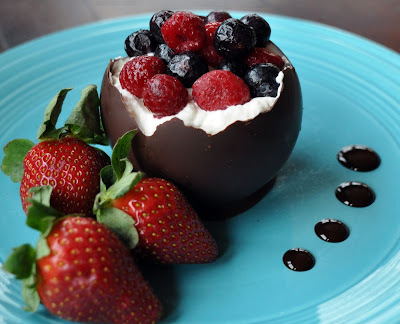 Spoon whipped cream into chocolate bowls, top with berries and a few drops of chocolate on the plate. YUM! Wow...these are stunning! What a great idea. I like the shape of the bowls. I could see them for dessert on Easter, since they look like half a cracked egg to me. What a fantastic idea! Thanks for the comment on my blog. I became a Facebook Fan of you and added you to my reader. Keep up the excellent work. Thanks Pamela! Wouldn't these be great at Easter!? Use white chocolate...or you could add some pastel colors to the white chocolate. 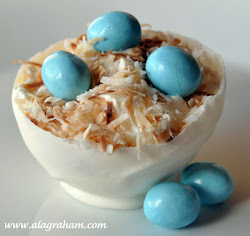 I got the link of your blog from Sweet and Savory and I wondered how you made this bowls.. im glad i skipped over to your site and voila, it's through a balloon! how neat is that! thanks for sharing! I love the presentation and the idea! it would definitely look good on white chocolate too! Did you get my comment from yesterday about your being highlighted in Our Krazy Kitchen and on Chocolate Obsession? Oh my ...me too here thru Chaya's super blog...aint she a darling? Thanks so much...I am so excited I won! What an easy, beautiful dessert! I love it! Delicious, how tasty they are, I would like to complete my appetite for all those chocolates, they really love me and I love them, I really love to have one on my mouth. Oh boy, I am in love with this. how absolutely gorgeous and what a great idea....I am copying you...will let you know when I post. Made these for our Easter dessert and they were both delicious and fun! Thanks!! 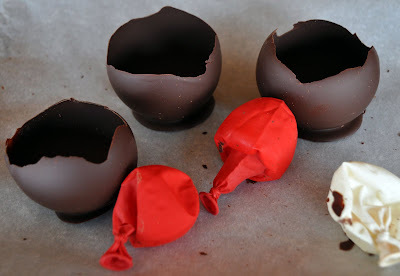 Another way to let the air out of the balloons w/out popping them, put a piece of tape on the balloon, above the chocolate line, when ready to deflate take a pin and poke through the tape. The tape will keep the balloon from bursting! Unfortunately these would kill me seriously!! People with Latex allergies CANNOT come in contact with latex balloons. If they are used like this they leave a bit of the latex on the food. If you serve these please let people know they are not latex free!! What type of balloons do you use? 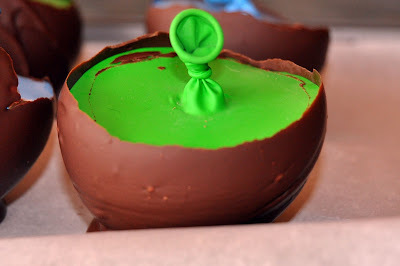 I tried this once and the balloons would "POP" once they come in contact with the chocolate. I cannot remember the name brand but they were from a bag of basic latex 9" balloons that I bought from a party store. I didnt have any issues with them popping. I have bought a bag of balloons before at a Dollar Store and they were much thinner latex. I would go to a party supply store and buy a bag or hand pick out of a bin. Going to try this for xmas pud. Will add icecream and fruit. I will try adding edible glitter to the chocolate when they are made into bowls. Chell.